A new treatment for spinal cord injuries using the transplantation of Schwann cells and inhibiting the formation of scar tissues is being developed at the University of Liverpool and University of Glasgow. 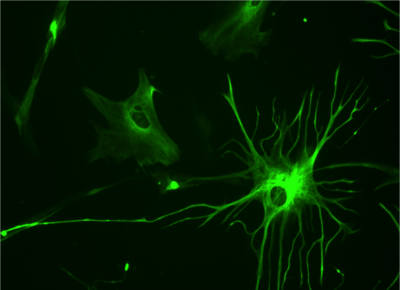 The most abundant cells in the central nervous system are astrocytes (see image). They are a type of glial cells, cells that provide support and insulation between brain neurons. Their function includes biochemical support of endothelial cells that form the blood–brain barrier, provision of nutrients to the nervous tissue, maintenance of extracellular ion balance, and a role in the repair and scarring process of the brain and spinal cord following traumatic injuries. The scar tissue that forms after a spinal cord injury is made up of the same protein that it replaces. But the formed scar is inferior to the normal tissue because of the over-expression of the protein and/or over-extension of the formed scar tissue. This results in inhibiting the regeneration of tissues. Generally, when the spinal cord experiences trauma that would fracture or dislocate the vertebrae, axons (nerve fibers responsible for transmitting signals) are cut off or irreparably damaged and neural cell membranes are broken. Almost immediately, the spinal cord will start swelling which cuts off blood flow and oxygen to the spinal cord tissue. As the blood pressure drops, it interferes with the activity of the other neurons and axons. The astrocytes start to react to the injury and starts the process of forming scar tissues along the injured area. The affected axons become dysfunctional, either because they are stripped of their myelin (the nerve cells protective sheathing) or because they are disconnected from the brain. The scar then creates a barrier to any still functioning axons inhibiting its ability to regenerate and reconnect to the central nervous system. Scientists at the Universities of Liverpool and Glasgow have uncovered a possible new method of enhancing nerve repair in the treatment of spinal cord injuries. It is known that scar tissue, which forms following spinal cord injury, creates an impenetrable barrier to nerve regeneration, leading to the irreversible paralysis associated with spinal injuries. Scientists at Liverpool and Glasgow have discovered that long-chain sugars, called heparan sulfates, play a significant role in the process of scar formation in cell models in the laboratory. Research findings have the potential to contribute to new strategies for manipulating the scarring process induced in spinal cord injury and improving the effectiveness of cell transplantation therapies in patients with this type of injury. Scarring occurs due to the activation, change in shape, and stiffness of cells, called astrocytes, which are the major nerve support cells in the spinal cord. One possible way to repair nerve damage is transplantation of support cells from peripheral nerves, called Schwann cells (the principal glial cell of the peripheral nervous system). The team, however, found that these cells secrete heparan sulfate sugars, which promote scarring reactions and could reduce the effectiveness of nerve repair. Scientists showed that these sugars can over-activate protein growth factors that promote astrocyte scarring. Significantly, however, they found this over-activation could be inhibited by chemically modified heparins made in the laboratory. These compounds could prevent the scarring reaction of astrocyte cells, opening up new opportunities for treatment of damaged nerve cells. Professor Jerry Turnbull, from the University of Liverpool's Institute of Integrative Biology, said: "Spinal injury is a devastating condition and can result in paralysis for life. The sugars we are investigating are produced by nearly every cell in the body, and are similar to the blood thinning drug heparin. "We found that some sugar types promote scarring reaction, but remarkably other types, which can be chemically produced in the laboratory by modifying heparin, can prevent this in our cell models. "Studies in animal cells are now needed, but the exciting thing about this work is that it could, in the future, provide a way of developing treatments for improving nerve repair in patients, using the body's own Schwann cells, supplemented with specific sugars." Professor Sue Barnett, from the University of Glasgow's Institute of Infection, Immunity and Inflammation, said: "We had already shown that Schwann cells, identified as having the potential to promote nerve regrowth, induced scarring in spinal cord injury. Now that we know that they secrete these complex sugars, which lead to scarring, we have the opportunity to intervene in this process, and promote central nervous system repair."